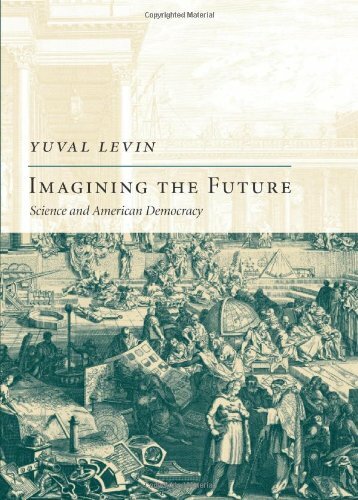 Yuval Levin is a fellow at the Ethics and Public Policy Center in Washington DC, and is founder and editor of National Affairs, a new conservative journal. I chose this one in part because it’s a lot less known than Burke’s Reflections on the Revolution in France, but in part also because it shows a different side of Burke, which I think is more representative. Appeal from the New to the Old Whigs was published in 1791. In a way it’s not a book, but a kind of pamphlet, though quite long, and it was a response to critics. It’s a response that denies all the charges of the critics, but nonetheless takes them seriously. I think the criticism that Burke took most seriously was that Reflections was just too angry. This book is much less so – it has a very different tone. The chief critic he responds to, though he actually never names him, is Thomas Paine, who wrote a really extraordinary response to the Reflections called The Rights of Man. Because of the nature of that response, Burke’s reaction in this book is deeper; it gets more into his world view. It’s a book that lays out his conservative disposition and shows that the origin of it is a kind of humility, or at least a rejection of the idea of choice at the centre of his idea of politics. One of the things that Burke’s critics made clear to him is that there was a less radical version of the kind of view that he was criticising in the Reflections. That less radical version said politics ought to be about letting people do as they choose. What Burke lays out in this book is a view of political and social life that denies the proposition that it’s all about choice. He has this one incredibly beautiful passage, where he describes the ways in which human relationships roll out of unchosen obligations – beginning with those between parents and children, flowing into those between the citizen and his society. He argues that the most important connections we have are not connections that we choose, and the most important obligations we have are not obligations that we choose. But they nonetheless define our lives. And a political philosophy that ignores that can’t be realistic, it can’t be functional. A touch of background for our readers: Burke is in many opinions the founding father of conservatism. By the time he wrote Appeal from the New to the Old Whigs, he was 62 years old. He’d watched the French Revolution, which he was horrified by, and he’d watched the American Revolution, which he was sympathetic with. That’s because he viewed it as an orderly revolution in some sense, not a dangerous one. Burke is most famous for his Reflections on the Revolution in France, which is a manifesto against utopianism. Does he go beyond his anti-utopianism here? Yes he goes beyond it, or I would say he goes deeper than his anti-utopianism, to show a little bit more of what a positive Burkean teaching would be. I think it’s fair to say that, at the very least because it’s a response to Thomas Paine who is very much a Jeffersonian. Burke actually never mentions Thomas Jefferson, not just in this piece but anywhere. Which is quite amazing. 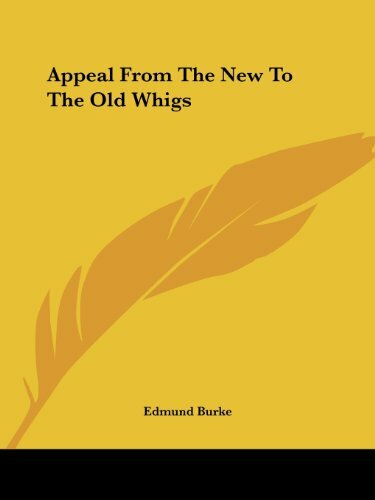 Why is it called Appeal from the New to the Old Whigs? Isn’t he an old Whig? The people that he calls the old Whigs are the Whigs of the Glorious Revolution. It’s an appeal, from his present day, to the people he considers the true Whigs, of the prior century. There’s a lot of Whiggishness in your book list. Is it, to some extent, a rediscovery of what used to be called Whig conservatism? I think that’s fair. It’s a more humble conservatism. It’s a conservatism that begins from a limited view of human nature and of the possibilities of politics. Your next book is by Alexis de Tocqueville. The problem with putting de Tocqueville on a book list is that everyone thinks they’ve read it, heard about it, know about it. Apart from the obvious fact that everyone should read it, why do you include it? Certainly everyone should read it. 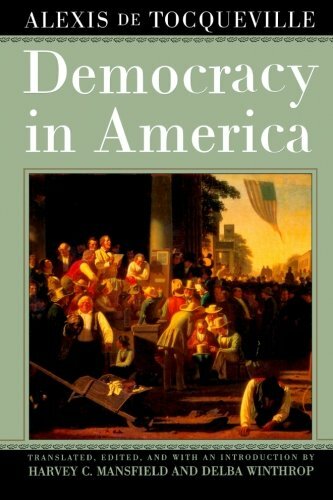 I think the way Democracy in America is relevant to understanding conservatism is that it lays out, especially in the second volume, in a really wonderful way, how ideas are translated into political institutions, and even more so into mores and habits and practices of everyday life. De Tocqueville saw people living their lives, but behind it he could see the ideal of equality acting on American society. I think it’s very important to a Whiggish kind of conservatism, to see how ideas translate into practice. They don’t translate in a simple way. They don’t just affect the words of the constitution and the structure of institutions; they affect every part of life. Exactly – changing family life, changing friendship, changing relationships between business partners, between renters and owners, in ways that would not be obvious. These changes were not an intentional function of the people who laid out the American ideals. And he’s not altogether comfortable with that? He’s not altogether comfortable with it. De Tocqueville is very worried that the spread of equality will flatten social life and put people to sleep in ways that make sustaining democracy very difficult. And some of his worries are very relevant to conservatives today. He worries that all of this would open a space that would end up being filled by a large and centralised government. Some of his other worries would, in some ways, educate conservatives even more because they’re a little less familiar. For example, he worries about individualism, which he believes is a very corrosive force in society. He’s not much of a populist is he? I wonder how he’d feel about Sarah Palin and Tea Party-ers and all that. It’s very hard to know, and always risky to guess, but I think he would find some things interesting and lovable about them, but I think he would also worry about the effect on American politics. It’s very hard to define briefly. The Whigs thought of liberal institutions as an achievement, as something to be protected and preserved and treasured and they had a very cynical view of human nature and of politics. They were not utopians, but there was an idealism to them. They valued prudence more than idealism is one way to put it. 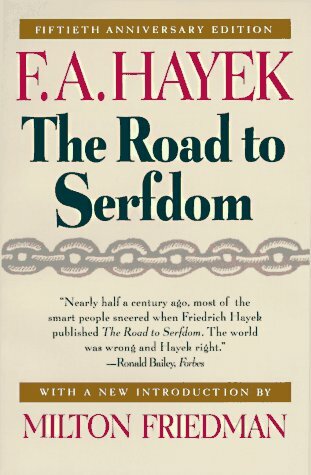 The Road to Serfdom is a very polemical book. It was published in 1944. It’s a warning not exactly about Communism, but about the coming of statism in the West, about the ways that some of the governing élites that Hayek saw, especially in Britain, thought about governing. The book is really mostly about Britain. He talks about the dangers of central planning, of the attempt to take over the economic life of a society and to try and control it from the centre. It’s a book that is properly understood as a libertarian book, but it’s not libertarian in the way that a lot of contemporary libertarians would define themselves. It is a very, very sceptical book, and a very modest book. In a way, Hayek argues for limited government because he has a very limited view of human nature and human knowledge. I think he would call himself a Whig. I think he actually did call himself a Whig, when he was asked whether he was a libertarian or a conservative. 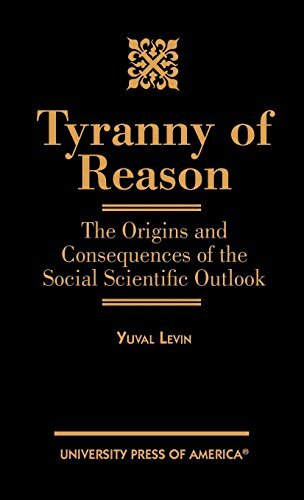 It’s a book that shows that at its best, the libertarian strain of conservatism is a form of scepticism rather than of utopianism. Freedom doesn’t solve all our problems, it’s just a recognition of the limits of our knowledge and powers. It’s the least worst response to human limitations. How does that distinguish from the libertarianism of a Jeffersonian or his modern equivalent? Jefferson was a very different kind of libertarian because he believed in the power of reason, and the power of freedom, to lead, in the end, to a perfectly organised society. Jefferson was a libertarian in the sense that he didn’t want big government, and was very worried about government power, but he was also a radical individualist. He believed that if we left people to themselves, and if we allowed reason to flourish and govern, our problems really would be solved. Jefferson was incredibly utopian. Hayek is quite different from that. He worries about the notion that unimpeded reason ought to govern, he simply doesn’t think that’s possible, he doesn’t think we can know enough, he doesn’t think we can contain the dark side of human nature. So his libertarianism is very realistic and very prudent and very modest. He’s not really against all of the welfare state. He thinks we have to have a lot of respect for institutions that exist, because they will inherently contain knowledge that is greater than anything we can articulate explicitly. And in this sense he’s very much a Burkean. He believes in the kind of knowledge implicit in institutions rather than knowledge made explicit in constitutions. So what do Hayekans do, or Burkeans do, when they reach 2010. You’ve got big government, bigger than they’ve ever liked, but big government itself has become embedded in mores and traditions. Are you stuck between a revolutionary fervour to overthrow it all, and a shrugging acceptance that we’re stuck with it? Or is there some third path? I think you look for ways to roll it back gradually. Burke in the Appeal draws a distinction between change and reform in politics. Reform is a way of building on what works about your society and fixing what doesn’t work. It doesn’t mean you leave things as they are; it means that in calling for change and in setting out change, you begin from where people live, you begin from what works in people’s lives. And today certainly some of that is the welfare state. But that doesn’t mean that’s where you end up. And I think it actually means resistance to radical expansions of the welfare state, to things that aren’t well-established, or that aren’t ancient. I think that in that mix there is a place for modern conservatism to make its case for a different kind of society, but not fundamentally different, not radically different. When you told me that The Road to Serfdom is relevant in our era of justified populist fervour, what did you mean? I think that inherent in The Road to Serfdom is a defensive populism, a defence of both the wisdom of the individual and the wisdom of society. What I mean by justified populist fervour is that what we’re seeing is a reaction to an extension and growth of the welfare state, that to my mind is justified. The question is what form will it take in response, what alternatives can it offer? That’s a place where conservatives can look to Burke, and Hayek to some extent. The answer is not obvious. It’s not clear what opposition to Obama’s policies has to amount to. I do think there is a place for resistance, a place for standing against the expansion of the welfare state and making a case for moving in a different direction. from 1983. It contains a marvellous sentence: ‘To those who are liberal, and to those who call themselves conservatives, I say “politics is more difficult than you think”.’ This is a book about the fundamental importance of politics and the inability for us to rise above it, or view it as politics. It rejects the idea that politics is a dirty thing we’d be better off without. That too is a very Whiggish idea – is that why it’s on your list? That’s right, and George Will says as much in the book. This book is on my list for a few reasons. One of them is personal – this book was a path to conservatism for me. I discovered it as a high school student in the mid-90s – by then I was interested in politics and it was clear to me that I was a conservative. What this book showed me was that there was a way to be a conservative that was not dismissive of politics. In a way, it’s a corrective to libertarianism. It’s also a corrective to social conservatism; it stands for what I would now describe as a small ‘r’ republicanism. You say there’s a tension in the book with social conservatism. Would a standard reading of social conservatism say it is the school of conservatism that understands the importance of – and need to use – law to fashion public morals? 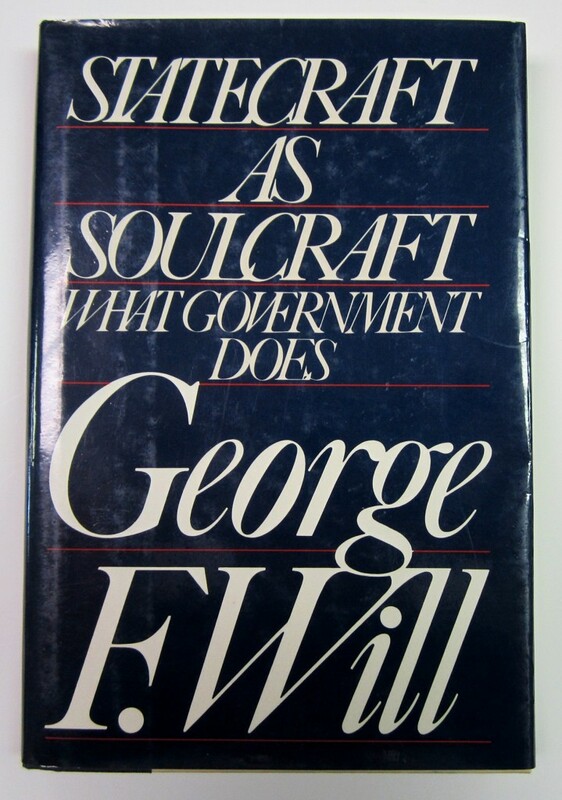 Yes, but I think that’s a little different from what George Will is doing in this book. I think this book is about forming citizens, and social conservatism is about forming human beings. In both cases, there’s a role for government and the law, and in character formation, but the question is, what sort of character formation? Will’s book is deeply respectful of the difference between private and public, in a way that social conservatives would think is probably excessive. But he doesn’t define public in the very limited way that libertarians would. It really does stake out a middle ground, where a public life is actually something very important, and government has a lot to do with the shape of our public life, but that is not the same as shaping private morals. , published in 2003, not to a great deal of fanfare. It’s not considered part of the conservative canon – why is it on your list? I was Leon Kass’s researcher for part of the time he was working on this book. It’s on this list because, to my mind, it’s the best example of social conservatism as an intellectual exercise that I’ve seen. It’s a close reading of the Book of Genesis, but it’s not a dogmatic reading, it’s really not even a theological reading – it’s not about God exactly. 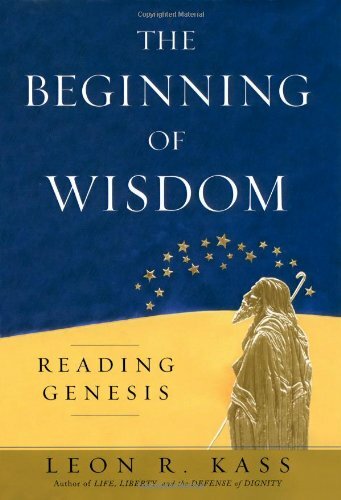 It’s a philosophical reading in the sense that it takes the Bible to be a work of philosophy and it approaches it the way you might approach Plato’s Republic. It tries to tease out an understanding of society, and especially family life – which is really the central theme of the Book of Genesis – and it lays out, in an incredibly insightful way, a kind of anthropology of the family. It’s a reflection on the human meaning of family life, and how that leads into social life. So it seems to me that it should be on this list because it is a kind of check against libertarianism, against radical individualism. It argues that libertarianism, even at its very best, can’t be sufficient to our understanding of society. It also highlights why strong families are the essence of a strong nation. I think it also illustrates by example what it is to seek wisdom from tradition without being slaves to it. It highlights our debt to family and to those generations before us that Burke and Hayek warn us we cannot simply dismiss. It’s a book of generations in a way. It is, and if you look for a theme in these books I’ve chosen, and in my own conservatism, that’s certainly the theme: generational continuity which is both a fact of life and a source of strength. I think it’s one of the ways conservatism and liberalism in the modern age are rather different. It’s one of the ways I’m not a Jeffersonian, who argues that the world belongs to the living and the present should get out of the way of the future. I think that’s a deep mistake – and one of the important purposes of conservatism is to highlight that. My fear is that modern conservatism has become a protest movement politics, which imagines itself to be revolutionary, but has no plausible means of bringing a revolution about. I worry a great deal about that. If you begin with Burke, conservatism has always been, to some extent, a protest movement. It in fact began in response to modern liberalism. But what these books suggest is that there are ways of carrying out that response constructively and responsibly. And I think there are, I think there still are.